The Changing Face of the Hauz Khas Complex : A Heritage Walk. Popular as ‘HKV’, in today’s modern lingo, known more for it’s upscale cafés, high end boutiques, antique shops and a bustling hangout was once a repository of culture and knowledge. This charming site has seen several twists and turns with time; it housed a water reservoir built by Alauddin Khilji, converted into a battlefield ushering the beginning of the Tughluq dynasty and got an uplifting during Feroze Shah Tughluq’s reign as he built a Madrasa; a seminary of international repute. It also became his final resting place. On 9th December, we will walk down these incidents with walk leader, Aditya Pathak and will discuss the peculiar architectural innovations of the Firozian times, which laid the foundation of Indo Islamic architecture. ● Feroze Shah Tughluqs tomb. Parking is available at the meeting Point. The Greenzones of Delhi is a series of nature walks where we explore the big beautiful green areas of the city. 💚 🌳🦋🌺 In this tour we will walk from Rose Garden to Deer Park while identifying flora and fauna plus the participants will learn how to play an important role for conserving our environment.🌱 The greenery which sustains us has been getting destroyed in the name of “development” and illegal encroachments, while all the compensatory plantations is just on paper, ultimately destroying our health and future. In the heart of one of the city’s upscale localities lie scattered remains of the Delhi Sultanate’s fascinating history. 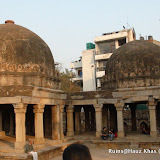 In an earlier walk we had explored the Hauz Khas complex, this time we shall walk through the Hauz Khas Necropolis, which holds a rich cultural and civizational heritage. This coming Sunday we shall understand how ‘Tarabaabaad’, at its zenith flourished under the patronage of the Khilji and Tughluq era until Taimur’s invasion finally crippled the Sultanate paving the way for the Mughal era in coming years. Date: 15th April ‘2018, Sunday. Nearest Parking: Either the Green Park market or the parking near Deer Park. We will be walking from the church and ending the walk at the Lake. Please choose the parking accordingly. Sharing a few snaps that we captured at the Hauz Khas Village complex. My sis, Arunima, helped me out with the camera work. The structures at this place are mostly from the era of Tughlaq and Lodhi dynasties.